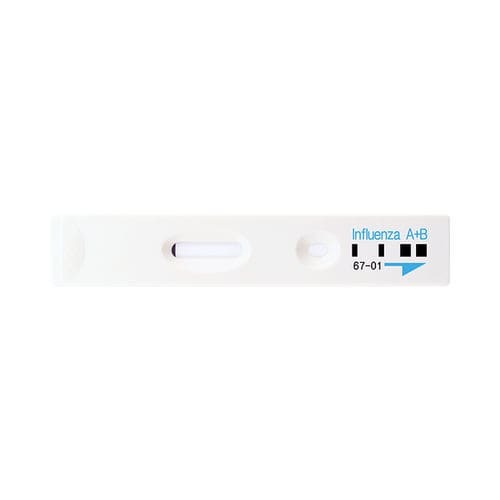 Flu test kit / influenza A / influenza B / nasal - ichroma™ - Boditech Med Inc. Laboratory > Laboratory medicine > Flu test kit > Boditech Med Inc. The Influenza virus, a single-stranded RNA virus, belongs to the family orthomyxoviridae and is known as ‘seasonal influenza’, due to the fact that in temperate climate it tends to occur in the winter months. Influenza, or flu, known as ‘febrile respiratory illness’ can cause mild to severe symptoms, such as a high fever, chills, headache, muscle pains coughing and even death. These illness typically begins after exposure to the influenza virus in the respiratory epithelial cell from person-to- person through sneezing, coughing, or touching contaminated surfaces. Within 48 hours after the onset of symptoms, the patient is strongly recommended to visit the nearest medical facility for the diagnosis of Influenza A or B and to take the antiviral medication. The preventive measure is highly required for those at increased risk for severe illness, so that early and differential diagnosis between influenza types A or B is very essential. This product is for in vitro diagnostic medical devices with which the infection of influenza A or B viruses can be determined within 10 minutes, much quicker and easier than the conventional diagnostic methods like PCR or viral culture which takes more than 24 to 48 hours for diagnosis.